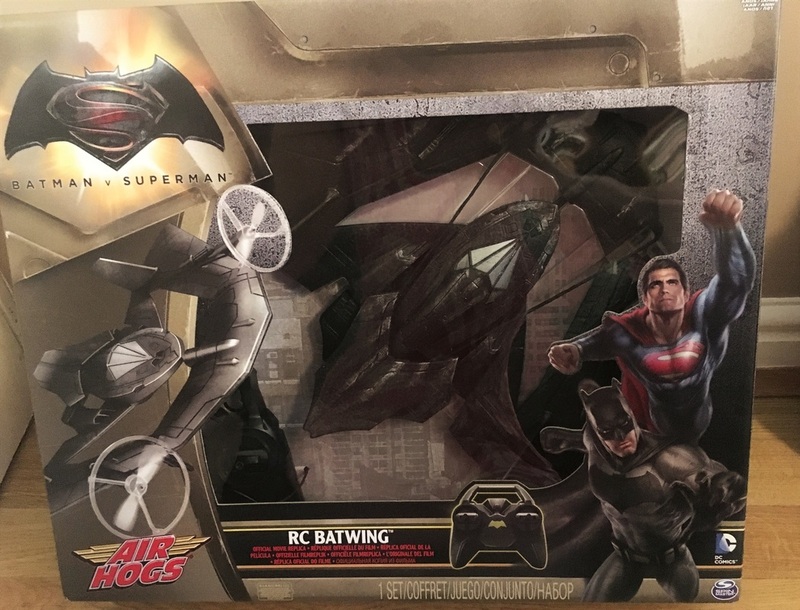 The Air Hogs Batwing is a replica from the movie Batman V Superman: Dawn of Justice and enables the user to recreate for themselves the moves of the plane from the movie, outdoors. As we opened the box there was a squeal from both my 8 and 5-year-old, it looks cool before you’ve even got it out of the box. The plane is quite flimsy but don’t be fooled by this it is a powerful little toy, but more of that later! You do need 6 AA batteries so have these in stock if Santa is bringing the toy for someone, to charge you also need a micro USB lead to go in either your computer or plug adapter. My hubby is a tech geek so luckily we have lots of these things lying around but it’s something to bear in mind if you don’t. 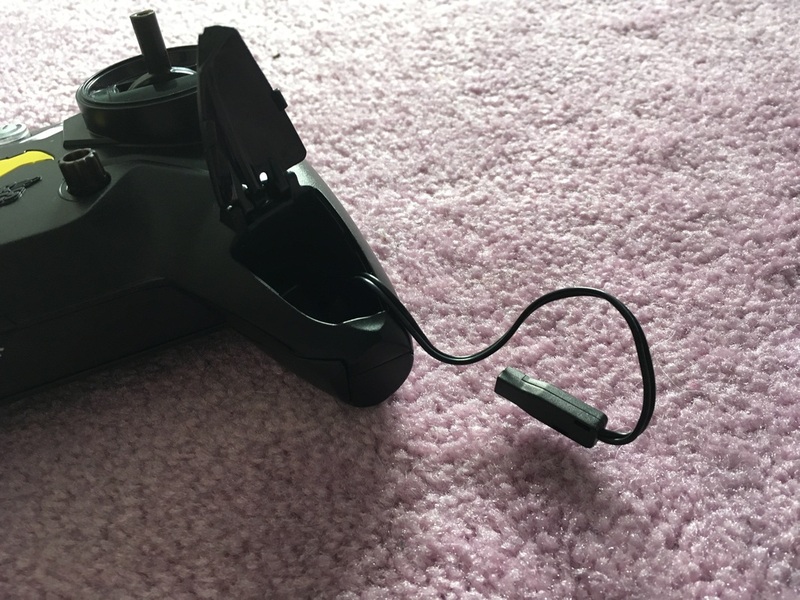 The hand controller has a handy lead stored under a little flap and easily plugs into the bottom of your plane, and you’re ready to charge. 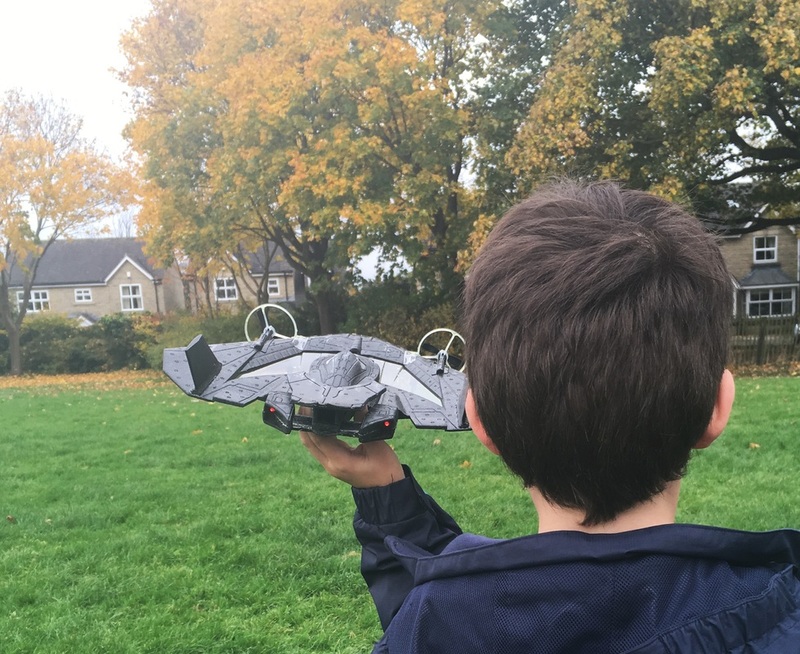 I was really surprised how quickly it charges which is great when you have impatient kids waiting to fly it! 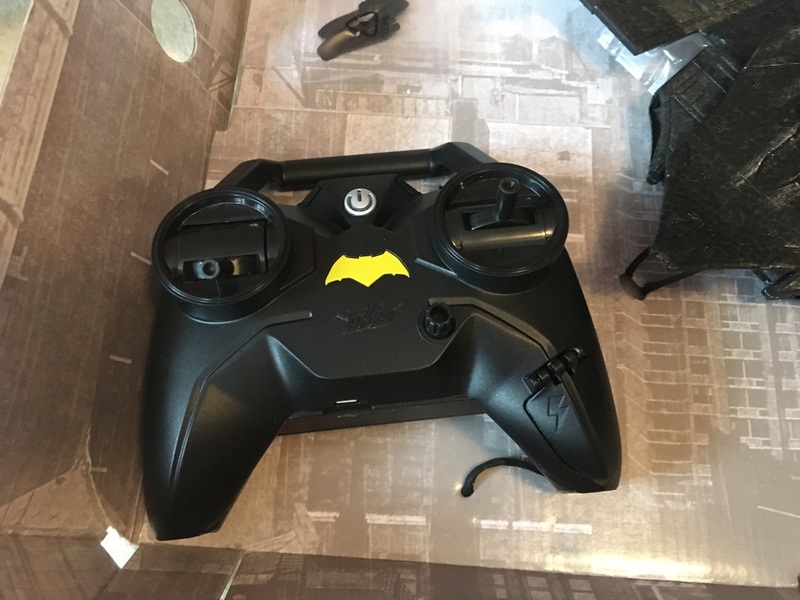 The batman logo flashes as it charges and stops when it’s done. 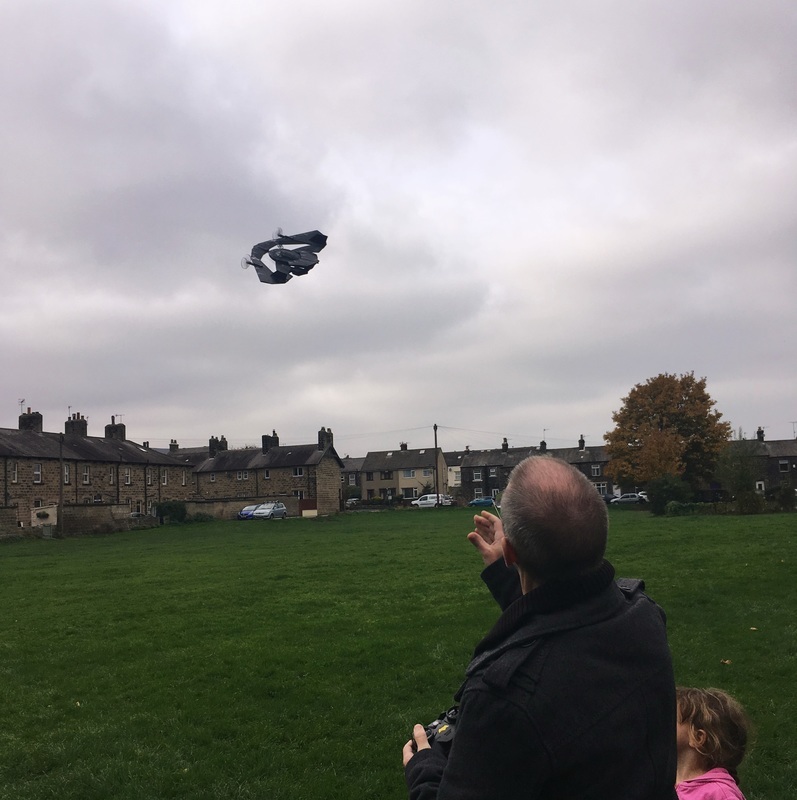 The toy is aimed for age 8 and it took the adults quite a few goes to get it flying never mind the kids. I would say that it is a toy that you need to practise and get the hang of, don’t expect to just get it out of the box and start doing cool moves immediately. 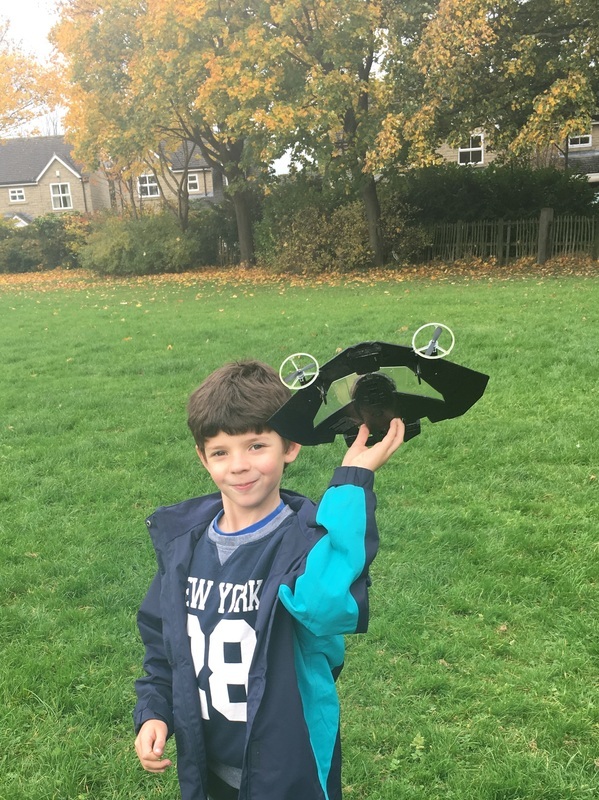 That is part of the fun of it though, and my hubby and son were soon experimenting with the power thrusters and spin motion to see how that would affect their flight. We had a few crashes, some more hilarious that others, I’m sure that plane kept making a beeline to crash into me!!! Would that ‘flimsy’ plane survive a few crash landings? It did and is surprising resilient having been crashed a few times and having a trip into a nearby garden. 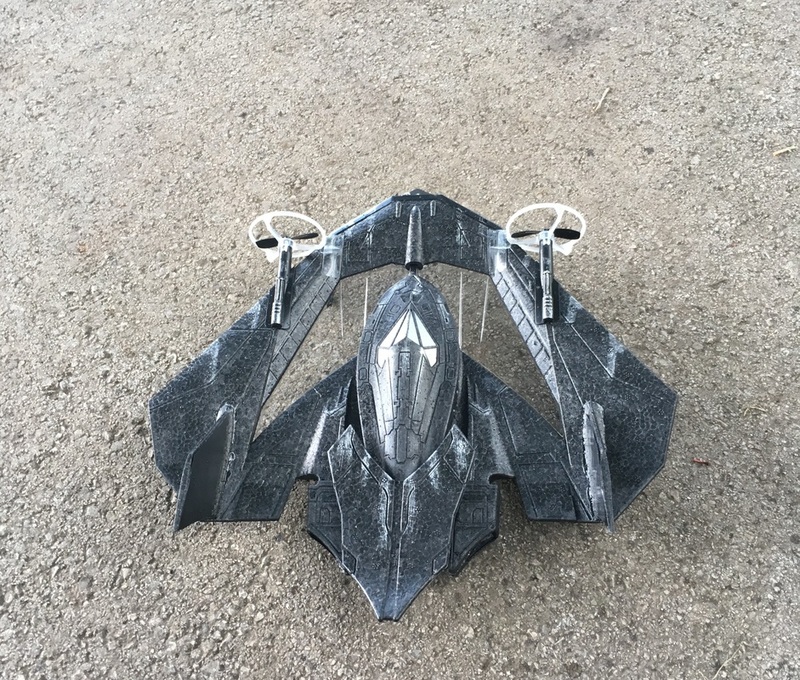 I was amazed at the height and speed you can achieve with the plane and this is down to the 2.4GHz remote control communication which provides high-performance, responsive control with up to a 250-foot range. So here are our top tips and best bits! 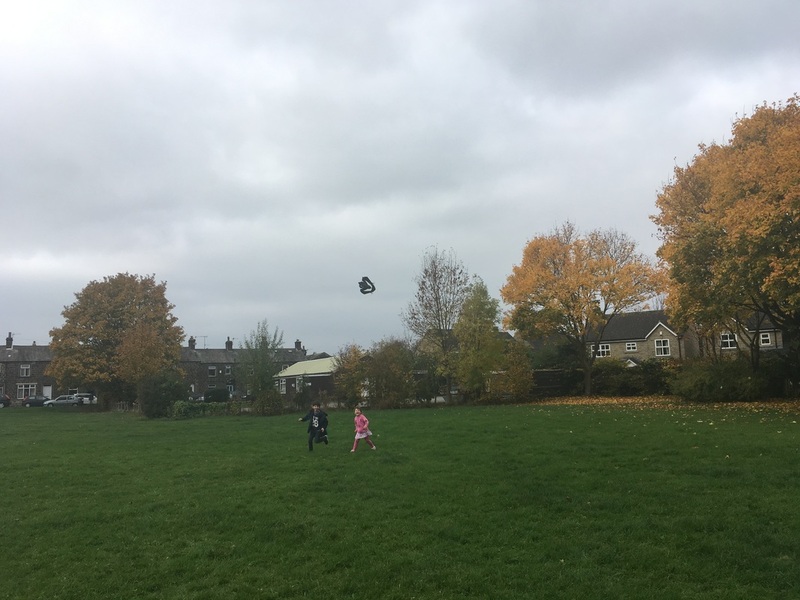 Our tops tips are that you need A LOT of outdoor space, we found a nearby field without too many trees or overhead wires was the best. There are little wheels to enable a run up takeoff but we found that someone holding the plane and getting the propellers up to speed before letting go worked best for us. It honestly gets easier with practice. If you do want to take off from the ground, you do need lots of run up and the surface needs to be very smooth. The best bits are we love that the rear thrusters light up when you accelerate! 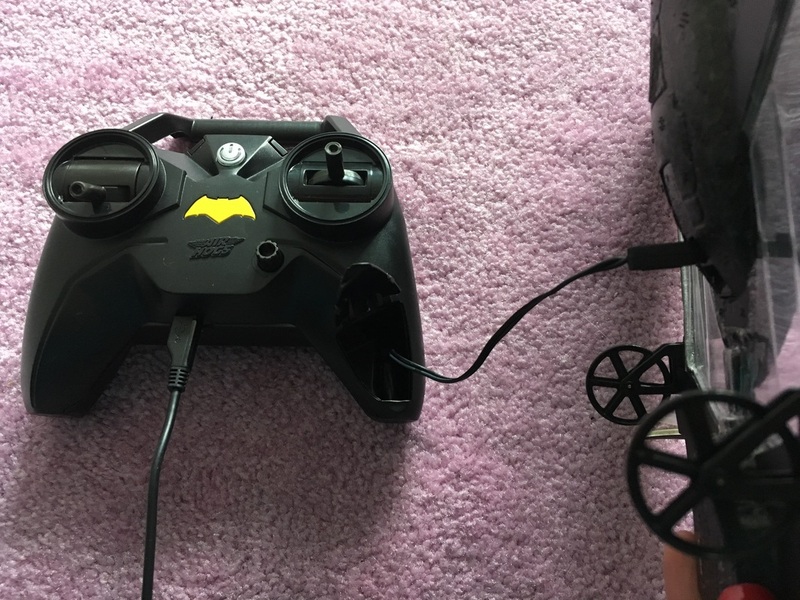 It’s also quick to charge and despite a few crashes our little Batwing kept going. Handily in the box is spare propeller parts should your crash be a bit bigger. 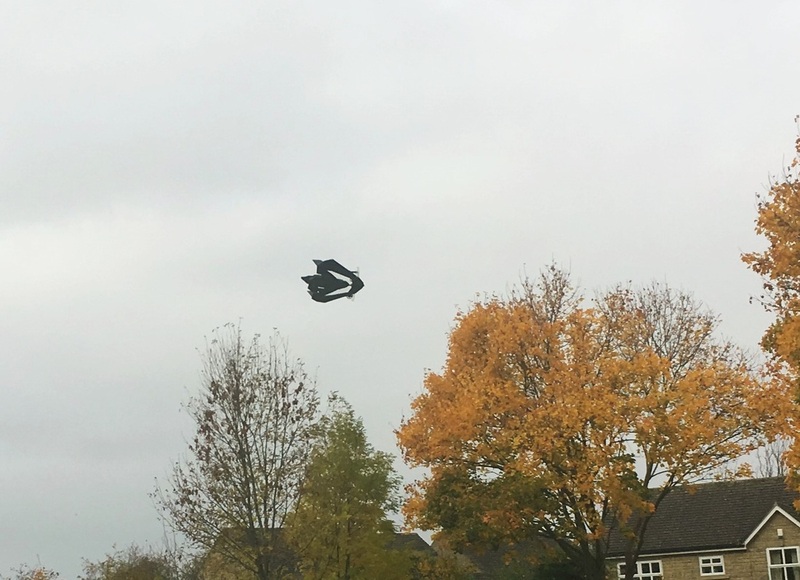 Although not all our flights were successful we certainly had fun trying and the Air Hogs Batwing kept four adults and two kids certainly entertained. 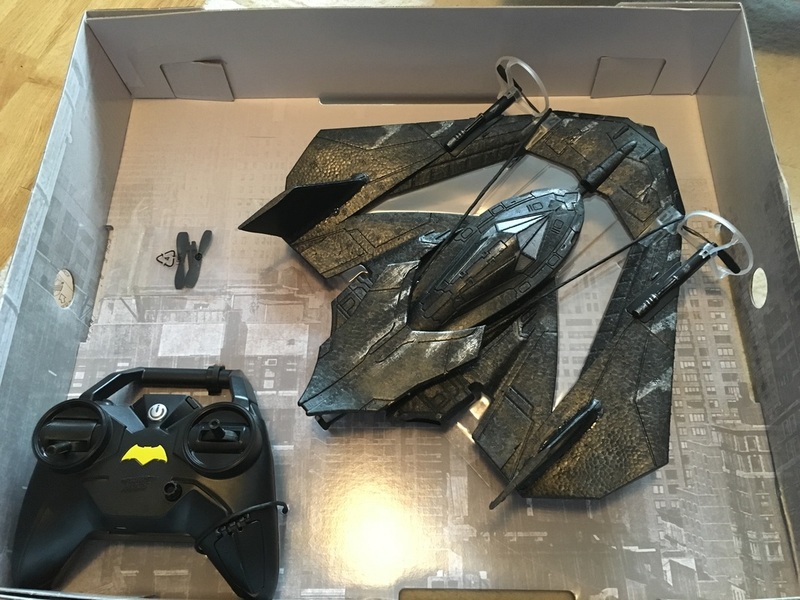 We were provided with a Batwing for the purpose of this review, however all views are my own.